I was reading a post over the weekend about reasons NOT to homeschool. I wasn't sure I was going to agree with the author or not since I am a huge homeschooling advocate and I wasn't sure where we she was headed with her argument. However, I do agree that homeschooling is not for everyone and while I always say that I do feel like I'm often arguing why homeschooling is for everyone. It's not and I don't mean to; mostly I'm trying to support those people just starting out in homeschooling or those people on the fence about homeschooling who don't think they can handle it. But it is true that homeschooling is not for everyone. I have tons of friends who have their kids in public and private schools alike and they often joke with me that I'm nuts to have taken this on. I can't say they're always wrong. Parenting is tough and adding homeschooling to my list of duties does make it seem tougher at times. I don't look down on them for their choices in any way, shape, or form. We all parent differently and to the best of our ability. It's like homeschooling versus traditional schooling has become the new bottle/ breast debate and I never engaged in that either. We all do what works best for us; if we all did the exact same things all the time our world would be a pretty boring place. You, as the parent, DON'T WANT TO! ; If you have no desire to homeschool, be a full time parent, or teach your child then you should not homeschool. Period. No matter who might tell you otherwise. If it's not something you think you'd enjoy or want to try you probably shouldn't. If your heart isn't it, if you're thinking of homeschooling because it seems trendy or because you feel like you should be homeschooling but you really don't want to then you probably shouldn't be homeschooling. Homeschooling is hard work, it takes determination, dedication and a real drive to keep going. You genuinely can't afford it; let's be honest there's only so much every family can do to tighten up the budget and living with one income may be impossible for some people. There are also many jobs that do not offer flexible hours to work opposite your spouse or provide adequate care for your children. If you can't possibly figure out how to feed and clothe your family then the kids would probably be better off in school. Both parents are not on board; I do know a few homeschooling parents who took their kids out of school even though their spouse was against it but I wouldn't recommend doing that. I respect and admire their courage to do so but homeschooling is hard and having a good support system is important. Besides, to me, homeschooling is a great opportunity to bring the family closer together and I'd be leery of doing something that could rip the family apart. Generally speaking it's probably not a good idea to homeschool if your spouse does not agree. You don't enjoy spending time with your kids; I know this one may sound harsh at first but I'm realistic enough to know that not all parents find joy in being with their kids. Perhaps they found parenthood more challenging than they thought or their personalities clash with that of their children. For whatever reason there are parents that are happier when they have plenty of time away from their kids. There is no shame in knowing yourself. 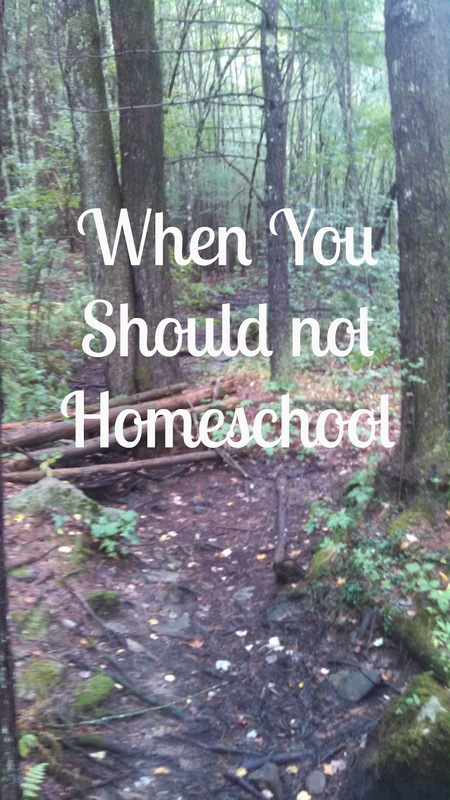 If you need time alone/ apart from your kids homeschooling might not be the right choice for you and your family. Your kids crave constant, daily, social interactions with people their own age; Yes, homeschoolers are very well socialized, we meet and talk to people all the time. We hang out with one another during the week during school hours. That said there are a lot of days when we choose to just hang out at home. We don't see anyone e and we're else and we're OK with that. The downtime is nice and it gives us a chance to cover all that pesky schoolwork. However, there are some kids who thrive around other children and need that daily interaction. That might be hard to come by with homeschooling. In that case your child might be better off in a traditional school setting. Your kids don't want to; Now you are the parent and you know what is best but if your kids are really, really resistant to trying out homeschooling it may not work for you and your family. Like having a spouse that does not support you, homeschooling can be very challenging if you have a child that does not want to do any schoolwork for you. Your days will be filled with battles; and most likely you'll be ready to quit in no time. You do not like to go against the tide; While homeschooling is becoming more mainstream it is still not the norm. We are asked questions ALL THE TIME. If you are uncomfortable with being "different" then homeschooling may not be for you. You have too much on your plate already; While homeschooling does not take hours upon hours a day to complete many families and adults are over committed. While it is true that many homeschooling families find time for both parents to work, a parent to take night classes, sell house/move, deal with illnesses (their own, their kids, their elderly parents, etc)., it may be better for all involved not to try adding homeschooling on top of an already overloaded schedule. It can be done but it may not be best for you. Know your limits.